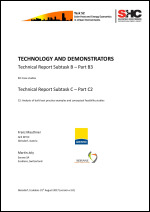 In Report C2: Analysis of best practice examples, information about built best practice examples as well as conceptual feasibility studies of solar thermal applications in urban environments is summarized. Objective is to highlight technical potentials, innovative approaches and restrictions of solar thermal applications in urban environments in a holistic energy system context on the one hand and to identify and describe lessons learned regarding applied methodologies, success factors and barriers on the other side. 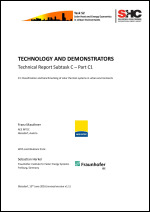 In the present report [Deliverable C1: Classification and benchmarking of solar thermal systems in urban environments], solar thermal system configurations suitable for applications in urban environments are identified first (chapter 4) and characterized by representative techno-economic benchmark figures from a set of best practice examples (chapter 5). Objective of this report is to provide a comprehensive data base for techno-economic (pre-) evaluations regarding the role of solar thermal in urban energy systems, especially applicable for urban planners / energy system planners without deeper theoretical solar thermal expertise.